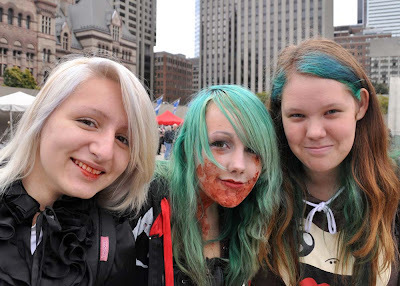 Bloody footprints mark the path of the 2013 @TOZombieWalk walk which takes place Saturday, October 26. 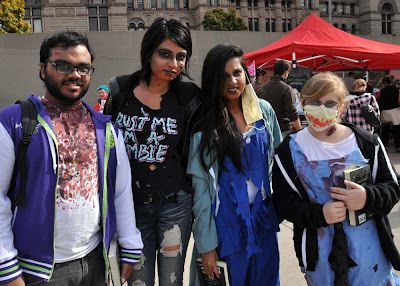 The horrible creatures will begin to shuffle into Nathan Phillips Square at noon, enjoy some pre-march entertainment, watch the 3 pm tossing of the severed head and the hunt for brains during the 3-5 pm Zombie Walk and Halloween Parade. Enjoy blood and guts with more entertainment after the horde heads back to Nathan Phillips Square. The undead will move from Toronto City Hall, north on Bay Street, east on Grenville (just north of College), south on Yonge past the Eaton Centre, a short shuffle west on Queen Street and back to Nathan Phillips Square. You can see the map here. 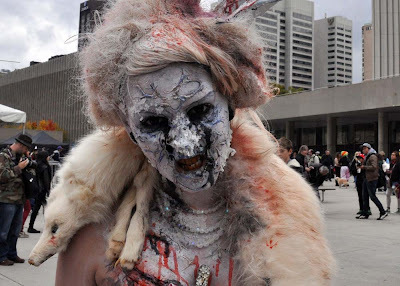 You are responsible for your own corpse leads off the walk's three code of conduct rules, second is respect other's personal space - no special mauling rights given to zombies and/or monsters. Finally, respect other people's property - eat brains but leave no marks behind.